When Air Force One landed outside Buenos Aires on Wednesday, Barack Obama became the sixth US president to visit Argentina – technically speaking, that is, for reasons to be explained below. In the last year of his presidency, Obama’s schedule-makers arranged a trip to follow his path-breaking visit to Cuba this week, but that caused something of a kerfuffle because the date of his visit to Buenos Aires – March 24 – coincided with the 40th anniversary of the coup that toppled the government of President Isabel Martínez de Perón in 1976 and started a reign of terror that became known as the Guerra Sucia (Dirty War) – for which many Argentines have blamed the United States. With that as background, it could be helpful to provide a short chronology of those presidential visits – the first of which was Theodore Roosevelt in 1913 – or was he? By that time, Roosevelt was an ex-president whose term had expired in 1909, and he had lost as a third-party candidate in 1912. 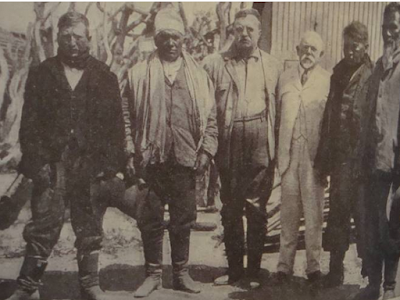 He did visit Buenos Aires, but his heart was in Patagonia, where he met the pioneer Argentine conservationist Francisco P. Moreno in Bariloche (in the photo above Moreno, dressed in white, stands to Roosevelt’s left). 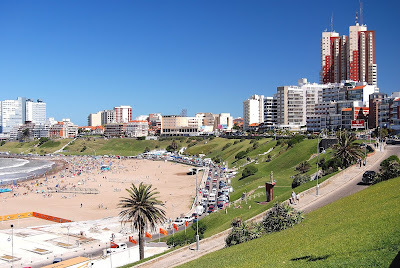 In truth, then, the first US president to visit Argentina officially was Dwight D. Eisenhower, who spent four days in Buenos Aires, Mar del Plata and Bariloche in February of 1960. 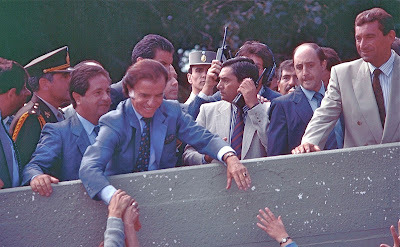 Hosted by then President Arturo Frondizi, he even spoke to the Argentine Congress but, at the same time, police tear-gassed demonstrators loyal to the exiled Juan Domingo Perón. 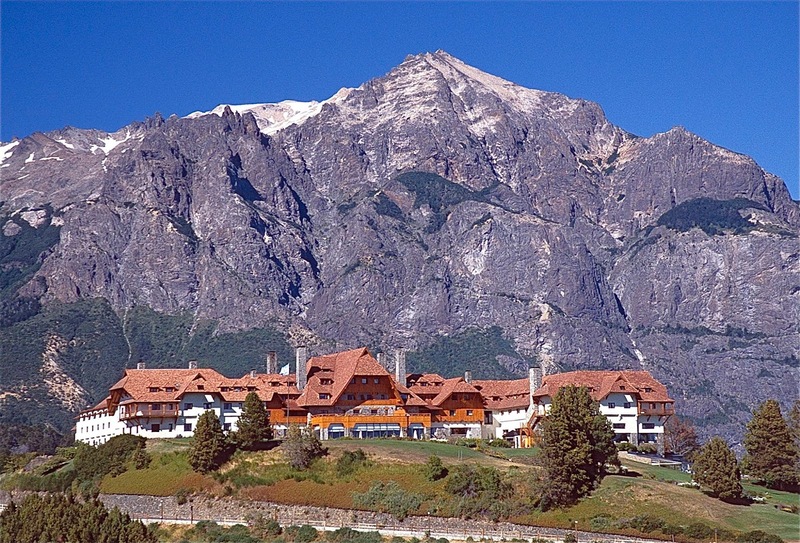 In Bariloche, though, Eisenhower fished and golfed while staying at the classic Hotel Llao Llao (pictured above). It was another 30 years before President George H.W. Bush’s visit coincided with a military uprising by so-called carapintadas, rogue junior officers who had been staged several rebellious incidents in previous years. Bush, to his credit, did not cancel or postpone his trip at a time when many still considered Argentine democracy a fragile flower. He did, however, play tennis with then President Carlos Menem (pictured above). President Bill Clinton’s October 1997 visit included a breakfast with Menem, where (in retrospect) he overstated the success of Argentine economic reforms that ended in the economic collapse of 2001 and their reversal under the populism of Presidents Néstor Kirchner and his successor/wife Cristina Fernández de Kirchner. 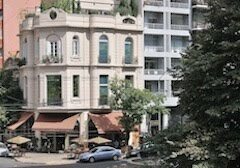 Clinton also met with Jewish leaders concerned about Buenos Aires terrorist bombings in 1992 and 1994 – neither of which has been solved – and participated in a televised town hall. Like Eisenhower, he stayed at the Llao Llao, indulged himself in golf there, and also went for an excursion on Lago Nahuel Huapi (pictured above) and spoke about global warming. All those visits were congenial, but the 2005 visit of George W. Bush – for the fourth Summit of the Americas in the seaside resort of Mar del Plata (pictured above) – was a disaster. It may not have been so catastrophic as his Iraq invasion but, as the New York Times editorialized, "he and his delegation failed to get even a minimally face-saving outcome at the collapsed trade talks and allowed a loudmouthed opportunist like [President Hugo Chávez} of Venezuela to steal the show." There was no thought of a recreational breather - the widely despised Bush Jr. left with his tail between his legs. Most recently, last week, President Obama received a warm welcome from newly elected Mauricio Macri, who succeeded Fernández de Kirchner (whose relations with the US were tense at best). Obama’s arrival put the conservative Macri in the awkward position of having to acknowledge “Dirty War” crimes of a period he’d probably rather ignore. One stop was the riverside Parque de la Memoria, dedicated to victims of the dictatorship, where the US president tossed a wreath into the water. The wall depicted above registers names of the victims, one of whom was my brother-in-law’s first wife. Obama took some flack for his arrival at this sensitive time – in fairness, presidential itineraries are not easy to arrange – but he responded by announcing the release of confidential documents about US encouragement of the 1976 coup. That was not enough for large crowds of the previous president’s supporters, who seemed to think he was a coup-mongering second coming of George W. Bush. Obama had made some untimely public criticisms of Fernández de Kirchner, but the visit still seems to mark the end of her administration’s international isolationism. Following the meetings with Macri, the Obamas headed for Bariloche – now the traditional destination of US presidents in the country – where they stayed at the Llao Llao, took a boat trip on Nahuel Huapi, and Obama himself sipped a brew at the Cervecería Berlina (pictured above). 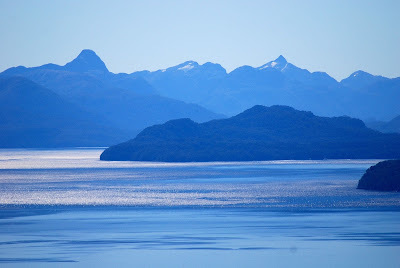 One major highlight of any Patagonian cruise is the wildlife. 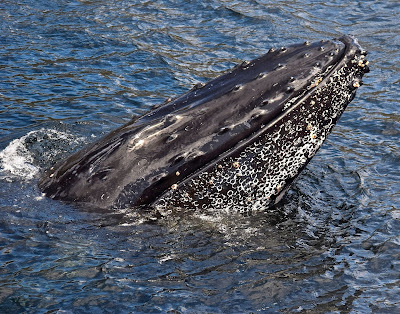 From the decks of any vessel, and on land excursions, passengers can enjoy the sight of countless birds – many of them unique to the Southern Hemisphere – and marine mammals such as elephant seals and sea lions. Literally and metaphotically, though, the biggest attraction is the whales. 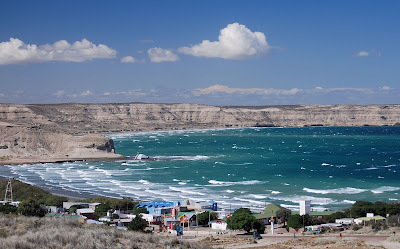 On Argentina’s Península Valdés, Puerto Pirámides (pictured above) is the continent’s main whale-watching site; from July (mid-winter) to November (late spring), pods of southern right whales arrive to mate and give birth. 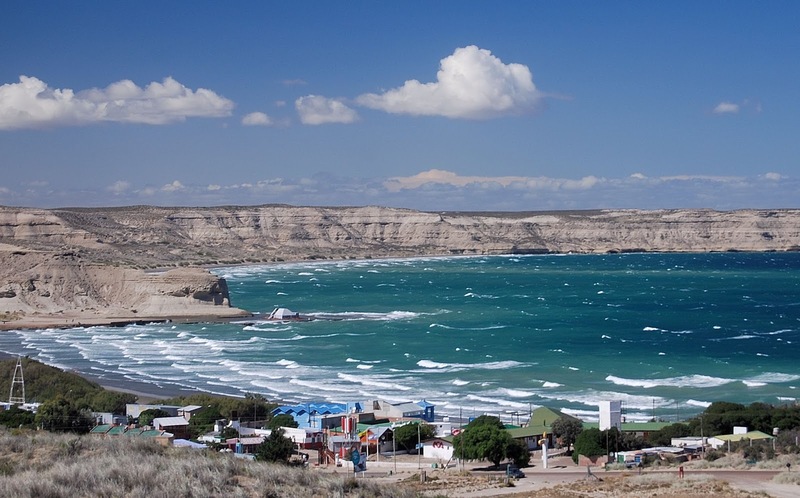 Most visitors arrive from the town of Puerto Madryn, which has cruise-ship facilities, though Madryn gets many more overland travelers. 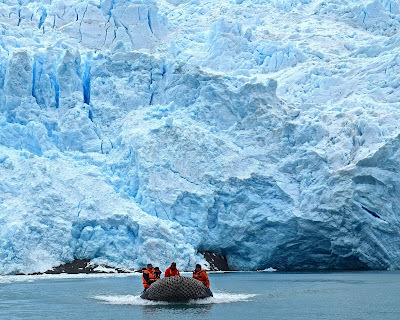 Most Pirámides vessels are larger catamarans that can seem crowded, though it’s not quite mass tourism – some smaller rigid inflatables get closer to the animals. For visitors to southern Patagonia, though, there are more intimate options, viewing southern humpbacks (pictured above) in the western Strait of Magellan. 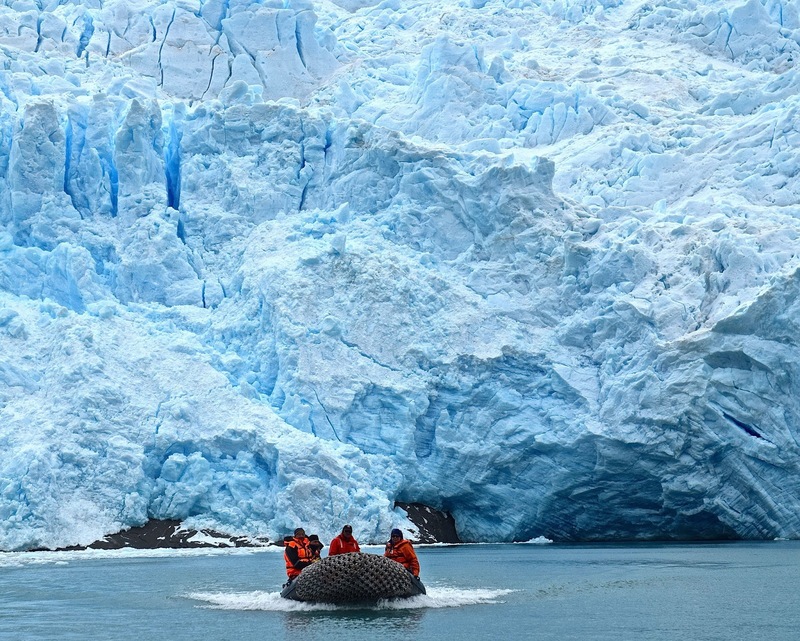 In January and February, operating out of Punta Arenas, Cruceros Australis does special whale-watching itineraries that make a detour to Isla Carlos III before returning to their usual Beagle Channel route to Cape Horn and Ushuaia. In rigid inflatables, passengers can get even closer to these gregarious (and enormous) animals. I’ve never taken that specific itinerary, but I have visited the western Strait on two other occasions. 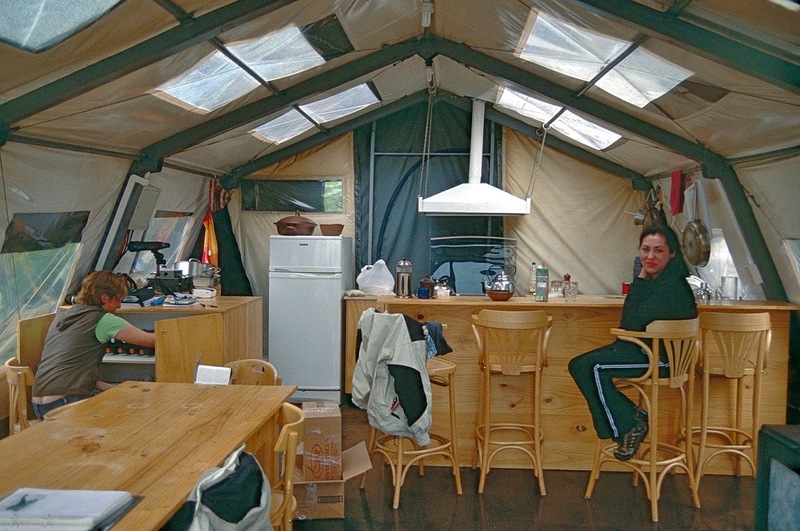 A decade ago, I took one of the earliest trips with Whalesound, which converted a small river vessel from Argentina in a comfortable shuttle for a dozen or so travelers to Isla Carlos III, where it had set up a dome-tent camp (pictured above) connected by boardwalks to its dining room/clubhouse (pictured below). During the day, the ship took us to see the whales, but it was also possible to hike to sea lion and penguin colonies. More recently, in January, I took a two-night one-day excursion on board the M/V Forrest (pictured above) with Punta Arenas’s Expedición Fitz Roy, which has rehabbed a vessel that formerly hauled wool around the Falkland Islands, where I first saw it in 1982. 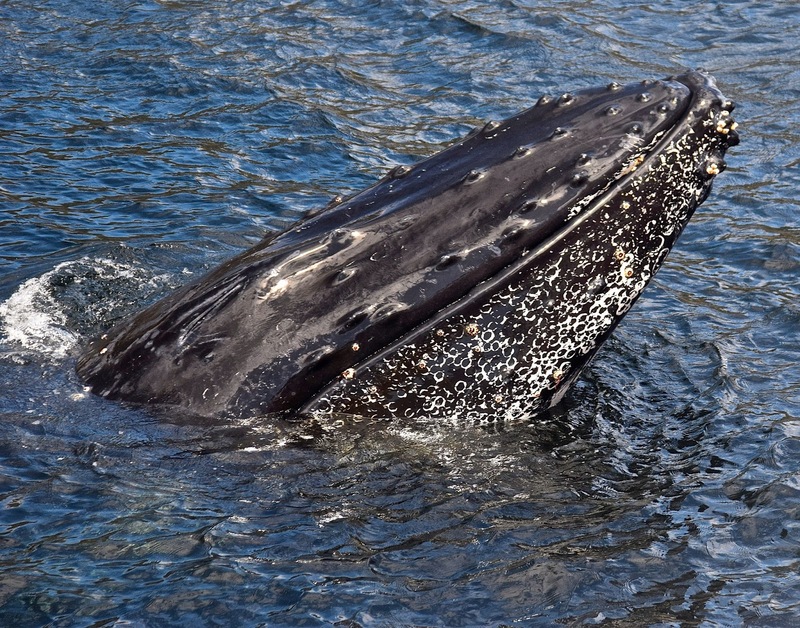 The accommodations are cozy – cabins with two or four bunks each – but the dining lounge is comfortable and the exterior decks provide plenty of opportunity for cetacean close-ups. 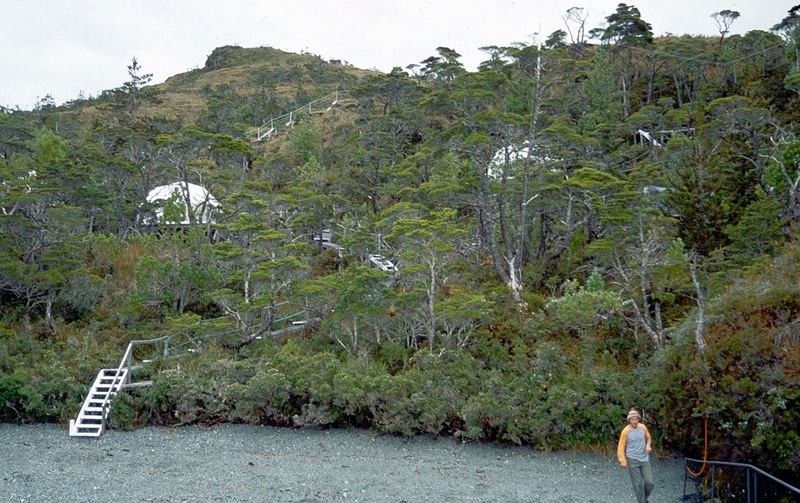 The Forrest also makes a side trip to Isla Santa Inés (pictured below), shuttling passengers ashore for close-ups of the glacier there. 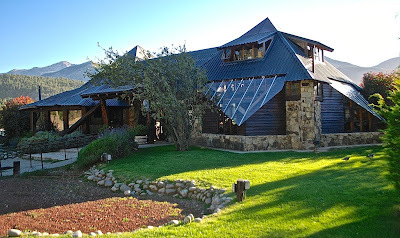 Perhaps my favorite route in southernmost South America remains Chile’s Carretera Austral, running through a region as wild as the Alaska Panhandle and the Canadian Yukon. Its downside, though, is the paucity of services – there is only one city, the regional capital of Coyhaique, and except for scattered resorts, there are few places to grab a bite along the highway. That’s changing, though, even in some of the smaller settlements as the highway improves and road trips become more common. 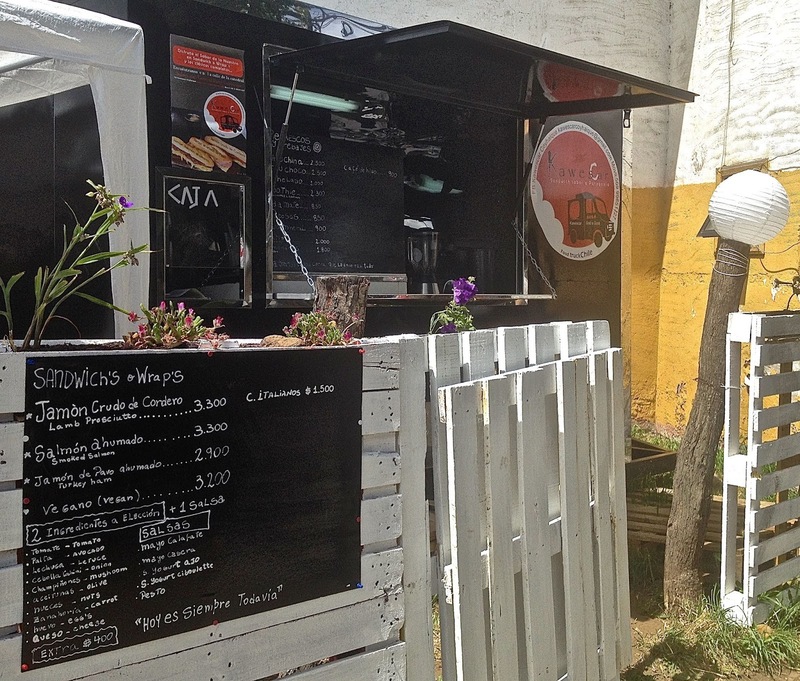 One intriguing aspect is the arrival of food trucks such as Coyhaique’s Kawescar (pictured at top), just a block off the pentagonal Plaza de Armas, but also in out of the way places such as Villa Cerro Castillo, where La Cocina de Sole (pictured above) occupies two parked buses where the southbound pavement ends (though preparations for paving the next segment are well underway). 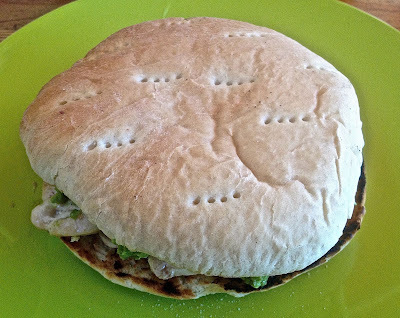 Lupe’s is basically a roadside sandwich shop, with quality versions of Chilean comfort food such as the Barros Luco (beef and grilled cheese) or ave palta (chicken with avocado, pictured below) on homemade pan frica (hold the mayo, please!). 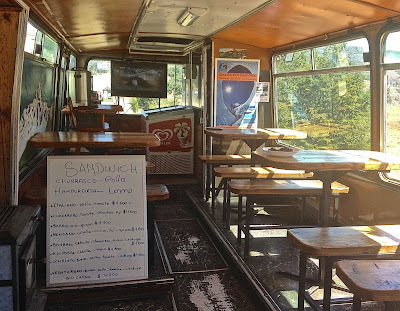 It’s comfortable inside, prices are modest, and it gets plenty of motorists and cyclists passing through town (or staying in town, for that matter). For me, it’s the best of the bunch. On the way north, though, I found another appealing food truck (a bus really, like Sole’s) in the town of Chaitén, which is making an impressive comeback after a major volcanic eruption and subsequent forced evacuation in May of 2008. 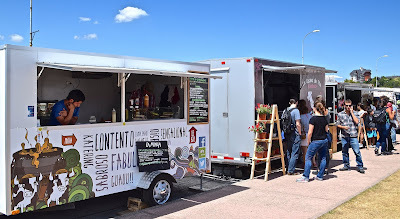 I still wouldn’t buy property there, but I’m happy to stay in a town that hasn’t completely recovered an already limited restaurant scene, the new Natour food bus is a welcome development. That said, the region’s food truck scene is in its infancy compared to more northerly destinations. 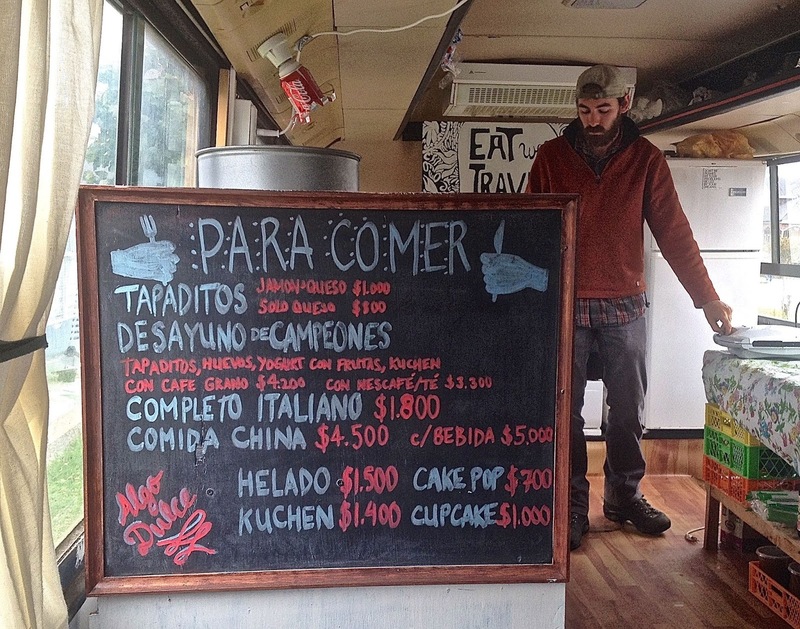 The resort town of Puerto Varas, outside the ferry port of Puerto Montt, has the most diverse food truck scene along its lakeshore. Varas also has many fine dining options, but the food trucks (and buses) – with Chilean, French, German and even Mexican choices, are a welcome change of pace.